A ketogenic diet may help fight everything from epilepsy to Alzheimer’s disease. Here, we offer a ketogenic diet food list, plus advice on getting started. Avocados and tomatoes are among the items you'd find on a ketogenic diet food list. 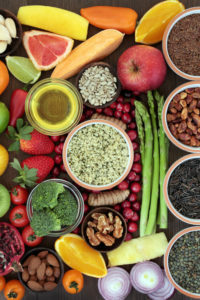 Whether you’re trying to lose weight, treat epilepsy, or control diabetes, our ketogenic diet food list may be a valuable tool for you. So what is the ketogenic diet? And what does a typical ketogenic diet food list encompass? The ketogenic diet is based on a high-fat, low-carbohydrate approach, with adequate protein to meet your needs. The purpose of the “keto diet” is to make the body use fats—rather than glucose (sugar)—as fuel. When the body turns to fat for fuel, the fats are converted into compounds called ketones, which is where the ketogenic diet gets its name. Eat very little, if any, carbohydrates. Avoid added sugars completely. Eat enough high-quality protein to meet your daily dietary needs. Choose healthy protein sources like grass-fed meat, fish, and eggs. To follow a ketogenic diet, you’ll likely need to make some adjustments in your daily food intake. And you’ll need to consult with a dietitian to make sure you’re safely and properly following the diet. If you have one of the conditions listed above and think that the ketogenic diet might be right for you, consult with a dietician or nutrition specialist who can help you to come up with a safe and effective meal plan. Guidance from a professional will make sure that you maintain adequate intake of important vitamins, minerals, and nutrients in your diet. Have you ever used the ketogenic diet to treat a health condition? Did it help? Share your tips for following a ketogenic diet in the comments section below. Brain. 2015 Nov 25. pii: awv325. Neuroscience. 2015 Nov 18. pii: S0306-4522(15)01018-0. J Child Neurol. 2013 Aug;28(8):1009-14. Redox Biol. 2014 Aug 7;2C:963-970. Br J Nutr. 2013 Oct;110(7):1178-87.
alzheimer, appetite, bipolar disorder, brain, cancer, cardiovascular, cardiovascular disease, cardiovascular disease risk, cauliflower, children, coconut oil, cooking, dairy, dementia, depression, diabetes, diet, diet food, fighting depression, food, glucose, health, healthy fats, high quality protein, keto diet, ketogenic, ketogenic diet, ketogenic diet food list, ketones, Lose Weight, losing weight, nutrients, nutrition, nuts, obesity, potatoes, protein, protein sources, seizure, sugar, vegetables, vitamins, vitamins minerals, yogurt. Great post and appreciate the updates. Just a note that while some food like yogurt, tomatoes and onions can be keto-friendly, there can be a lot of sugar in large servings (even a bowl of homemade tomato soup). Unless it’s unsweetened full-fat Greek yogurt like Fage, most yogurts won’t be keto friendly because they range from 14 to 30 carbs per serving. In any case great summary just wanted to add to the conversation.